This week I struggled through the Southern Rail train strike to attend a ReBUILD meeting in London. The long commute aside, this was a great opportunity to reconnect with colleagues and hear more about the consortium’s work and synthesised learning from the last few years. Being a communications person I was particularly taken by the discussions about how to encourage research uptake in fragile and conflict-affected settings. An eminent panel – Gibson Mhlanga, Ministry of Health and Child Care Zimbabwe; Lara Ho, International Rescue Committee; Rene Loewenson, Training and Research Support Centre; and Egbert Sondorp, KIT – gave us their views. They were chaired by Freddie Ssengooba from Makerere University, who plays this sort of role effortlessly. Fragile and conflict-affected settings have their own particular set of challenges when it comes to research uptake. Gibson Mhlanga talked about how a lack of funding for the health sector can prevent the translation of good evidence to change on the ground. To some extent this is a problem faced by all countries that fail to meet their commitments to financing the health sector, but can be more pronounced in these settings. When conflict or crisis abates, policy engagement may be trickier due to the multiplicity of stakeholders that one needs to relate to. In addition to the usual governmental stakeholders a range of donor and humanitarian actors may need to be taken into account. Egbert Sondorp talked about policy complexity, in that influencing must be more than ‘SWAP+PRSP+budget support’, and that after conflict or crisis, there can be a range of new settlements, directives, and regulations under construction which need to be understood and analysed. Finally, traditional academic methods of evidence generation (with their focus on academic publication and other incentives) may be at odds with more action-oriented approaches to the generation of new knowledge. Lara Ho talked of the need for demonstration projects to show to policy makers how potential interventions that have been used elsewhere might be adapted and implemented in fragile and conflict-affected settings. Just knowing that evidence exists is not necessarily sufficient to prompt change – new ideas need to be ‘brought alive’ so that they prompt the imagination. She suggested that exchange visits – where policy makers are accompanied to other countries to better understand how innovations have been implemented – can be a powerful tool for the uptake of evidence. Rene Loewenson explained how the ‘tactical generation’ of evidence may be needed, in a fashion that points to policy solutions rather than uncovering weaknesses and problems. In this, a less positivist approach to evidence, which is inclusive of different development sectors and utilises participatory methods, can be particularly powerful. She and Egbert pointed out that the traditional time horizons of ‘projectised’ research projects of 3-5 years may not be sufficient to implement a longer term, systemic approach that enables researchers to seize ‘windows of opportunity’ to effect change. Several speakers talked of the need to design research projects that meet the policy and programmatic needs of multiple stakeholders – implementers, decision makers, and communities – and that this requires an approach to the generation of research questions and approaches which is deeply embedded in the setting one is working in. Hearing from the panel I was struck by how seldom I get to go to meetings where research uptake – rather than findings – are the centre of attention. Learning from other communications professionals employed by health systems projects and hearing from those grappling with similar challenges is always reassuring (we are facing similar problems) and enlightening (there are routes to change that we can experiment with). I commend ReBUILD for creating such a space and hope that we can facilitate more of these shared opportunities for discussion. 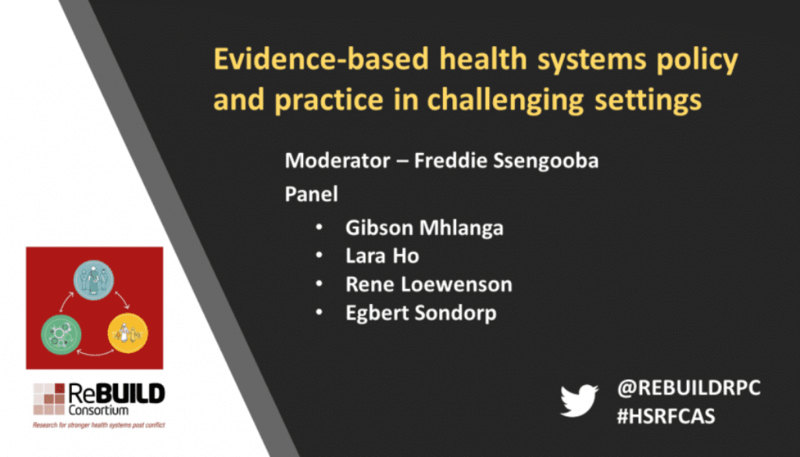 Four tips for embedding quality improvement in community health worker programmes	Power and prejudice: How does inequity play out in the institutions and processes of health systems research?